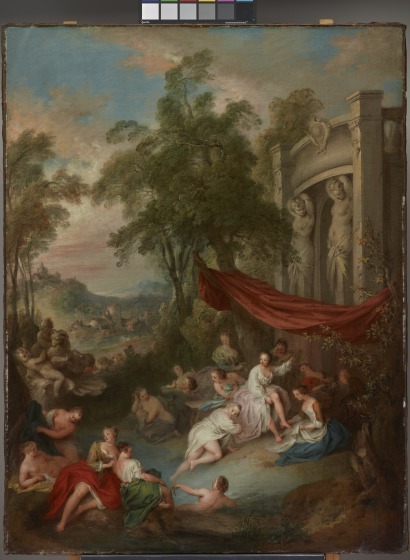 Jean-Baptiste Pater’s “Female Bathers near a Fountain (Nymphs Bathing in a Pool)” represents a significant departure from his earlier fête galante subjects or those of his predecessor, Jean-Antoine Watteau. 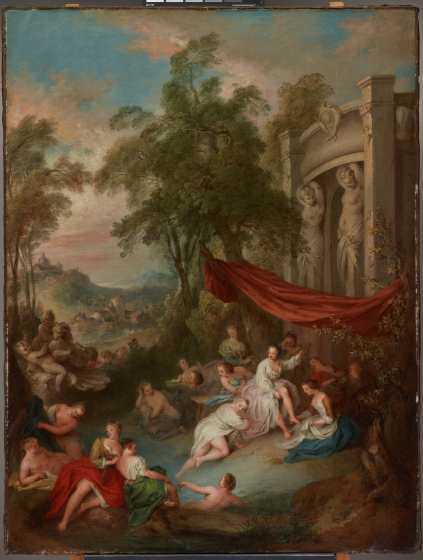 Unlike Watteau’s figural scenes set in an ideal of peaceful sociability, Pater’s bathers bring eroticism to the forefront. 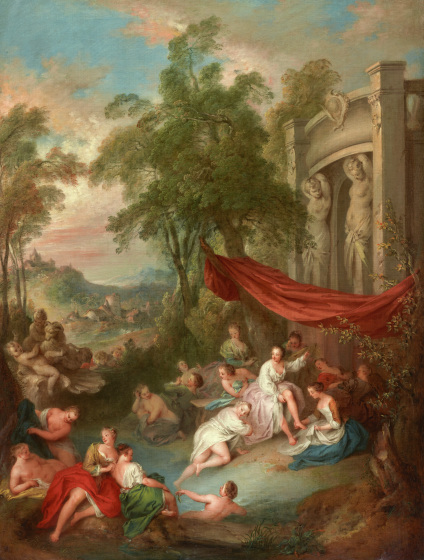 In an idyllic, hilly landscape, a group of sixteen women is assembled around a small pond in front of an elaborate pavilion. 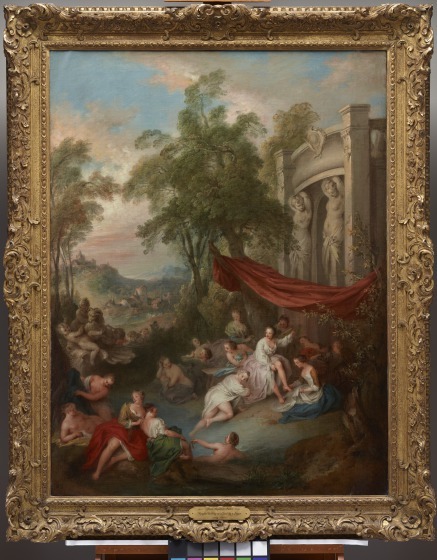 Its two monumental, naked caryatids set the stage for several naked or semi-naked bathers in the group, some of them protected against the sun by a large red canvas suspended from trees. At least two women attend as servants; others are still dressed. A shell-shaped fountain on the left is crowned by putti playing with a ram. A central group of bathers in white undergarments are lit by particularly bright light, thus creating a solid group. The bodies are arranged for the picture plane to reveal their flesh advantageously. The gaze of the—probably male—viewer is mirrored by three men in the background whose heads can just be made out above the vegetation near the fountain. They add a further titillating story to the scene, but they also reflect the pleasure of the painting’s viewer. Adapted from Christoph Martin Vogtherr, "Moving on from Watteau: Jean-Baptiste Pater and the Transformation of the Fête Galante," in “French Art of the Eighteenth Century: The Michael L. Rosenberg Lecture Series at the Dallas Museum of Art,” ed. 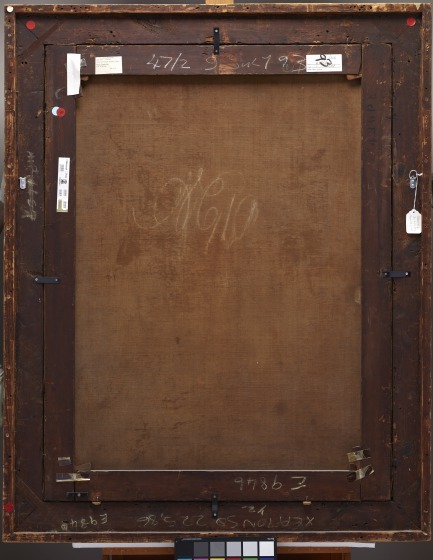 Heather MacDonald (Dallas, TX: Dallas Museum of Art and the Michael L. Rosenberg Foundation, 2016), 81–94.